Although a quality pair of headphones with properly fitting earbuds should eliminate most external noises, they aren’t too helpful when combating loud environments such as a car, plane, or train. 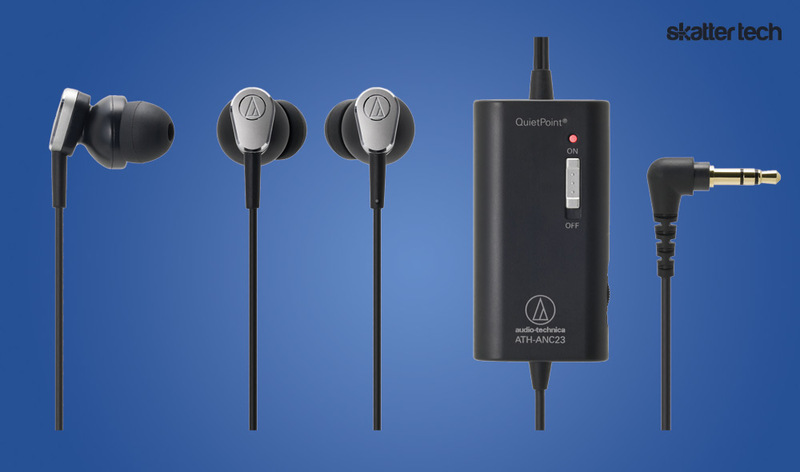 Fortunately there are solutions: Audio-Technica claims that their active noise-canceling (ANC) technology eliminates nearly 90% of all background noise. At CES 2011 last week, the company introduced the ATH-ANC23 headphones, an upgrade to the model we reviewed last year. For those who aren’t familiar with how active noise-cancelling works, these headphones feature small microphones in each earpiece which detect external noise and produce counter sound-canceling waves. Hence, the only sound a user should hear is the audio from their device. Although the ANC technology needs batteries to work, the ATH-ANC23 still work as a regular pair of headphones when out of power. Audio-Technica also includes Comply memory foam ear tips, which help bring addition noise reduction. The company also claims that these are much more comfortable than standard silicon ear tips. To ensure a good fit, multiple sizes of both Comply foam and silicon ear tips come with the headphones. Since the ATH-ANC23 features a standard 3.5 mm headphone jack, it is compatible with most devices including tablets, smart phones, and computers. Audi0-Technica also includes an airline adapter, a AAA battery, and a soft case in the packaging. While the older model started at a $169.95 price point, the new edition retails for just $100. As always, those who shop around will probably find these for even lower prices. Audio-Technica is clearly trying to bring the ANC technology to a more affordable price for the masses. This can only be a good thing as long as they do not compromise audio quality. These headphones will be available next month (February 2011) and we will publish an in-depth review as soon as we get our review unit.